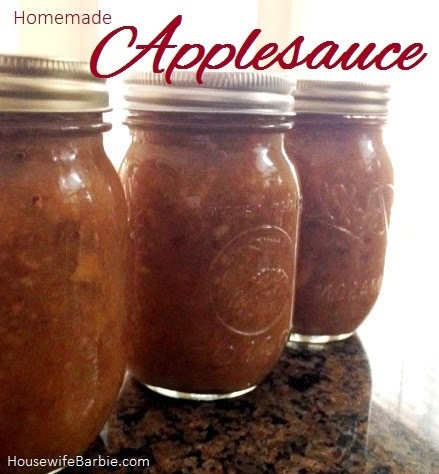 An American Housewife: Easy and Delicious No Work Crockpot Homemade Applesauce! Easy and Delicious No Work Crockpot Homemade Applesauce! For some reason Google did not cache this recipe and it doesn't come up in my site search on the right hand side of this page. I know this because I've tried to quickly look for this recipe TWICE in the last 2 weeks and it wasn't there. So I am going to RE POST IT and hopefully google will love it as much as my family does... because I cannot keep this on hand in our family! Seriously... my husband is like a sad little 6 year old when he finds out he finished off the last container of it. I now keep this on hand constantly. CONSTANTLY. But it's SO EASY and no work that it's not a big deal. I simply wash a bunch of apples, cut them up and core them, dump them all into a crock pot and pour a tiny bit of water in it, a bit of lemon juice, add 1 stick of cinnamon and a tiny bit of sweetener (a tablespoon or two) and then I put the lid on and FORGET ABOUT IT. FOR HOURS. And when my house smells really good, I remember the apples... I check on them and they are mushy, so I plop them into a food processor and pulse... and pour them into containers. Sometimes they go into the refrigerator and other times I take a half hour longer to 'can' them in a water bath so I can store them in the pantry instead. I've taken to putting these into pint sized jars - perfect size for my husband to eat in one sitting and he can take them in his lunch. ***You don't have to add sugar because it's sweet enough as it is, and because if you use it to bake with later on, you don't want all that 'extra' sweetness to ruin your dish. Do a taste test. I ended up putting a little bit of natural sweetener in this batch, (about 1 T) along with about 1 1/2 T Baked Right natural sweetener with cinnamon because my husband eats our applesauce - I don't cook or bake with it. I canned this batch but you don't have to. You can just put it in the refrigerator and eat it up! You can peel the apples if you wish but the peels add color and nutrients to the applesauce and they get very soft during cooking so they are easily mashed in. I just wash mine and then use an apple corer/slicer to core and cut them into wedges with one push. Using this I have about 4 pounds of apples cored, sliced and into a crock pot in about 2-3 hours. I just put them in and forget about them - and a couple hours later, open it, stir, and see if they are soft. Your brand and size slowcooker is going to make a difference in how long they cook as well as the variety of apple you are using, how hard/crisp they are and how old they are. Combine the apples with just enough water to coat the bottom of your crockpot or slowcooker so they don't stick. Cover and heat on high for about 2-ish hours depending on your brand, size and style slow cooker. Do not let them burn, but turn it off when the apples are soft. You can also cook them on the stove if you wish. On the stove, add enough water so the bottom of the pan is covered and the apples won't stick or burn. Bring to a boil over medium-high heat. Immediately educe heat and simmer, stirring occasionally, for 10 to 20 minutes, until apples are tender. Remove from heat and let cool about 5 minutes. Get your canning supplies ready. The jars should be clean and hot; kept in simmering water until you need them. The rings and lids clean and hot. Have a pot on the stove with water ready to process them in boiling water. Working in batches depending on the size of your food processor, process them on pulse with the S-blade until just smooth. Don't over process. Place apple mixture in a saucepan. Add lemon juice. Bring to a simmer slash boil over medium-high heat, stirring frequently to prevent sticking. You can add a bit of cinnamon or nutmeg if you wish too! Ladle the applesauce into hot jars leaving 1/2 inch head space. Remove air bubbles by sliding a butter knife or skinny spatula around the jar and jiggling it a little to settle the sauce. Wipe the rim with a clean, damp rag or paper towel. Center lid on jar. Screw on the band just to hold the lid in place, not too tight. Water bath process the jars in a boiling water for 20 minutes. Remove jars and let set on the counter to cool slowly. The lids should all be sealed down tight and not 'give' when pressed in the center with your finger or thumb. That's it! You're done. *You can use citric acid or something like Fruit Fresh to help preserve the lighter color but I didn't on this batch. You could mix about 1/2 teaspoon citric acid with the water before adding to the apples to cook. Use a mixture of apples of different varieties for the best flavor. Don't use green apples or Granny Smith though. If you own one of these, you can have them sliced and cored in minutes. You can peel them if you wish! I don't. Throw them in a crock pot or saucepan on the stove with a little water. That's it! When they are tender and break apart easily, it's time to mash them or process them. As chunky or smooth as you like. I use a processor and pulse it a few times. You can mash by hand though. I added some sweetener and cinnamon to this batch - my husbands favorite. You can make it very smooth, semi smooth, or leave it chunky. Whatever you like. Refrigerate it... or can it. This batch makes 3 pints with just a little left over (the white dish in the photo above was the leftover after canning).